Microgaming is renowned for their enthralling online pokie productions. 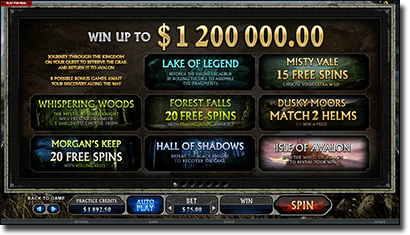 The gaming giant has delivered yet another instant classic with their online pokie, Avalon II. Based around the myth of 5th/6th Century British leader, King Arthur, Avalon II: The Quest for the Grail is a gaming narrative and a much improved sequel to the original Avalon game. Discover how and where to play Avalon II for real money bets online. Avalon, according to Arthurian folklore, was the island the young King fled to after a fierce battle. It was here that the Lady of the Lake bestowed upon Arthur the legendary sword Excalibur. The original Avalon online pokie was a five reel, 20 payline game whereas this new and improved sequel is a five reel, 243 payline pokie, so it gets my tick of approval. 243 paylines tickles my fancy, because there is nothing more infuriating than having five symbols spin up on a 20 payline pokie and realising they have not fallen on a genuine pay line. This problem is eradicated with 243 payline pokies. Microgaming pokies are widely available across the vast majority of online casinos. 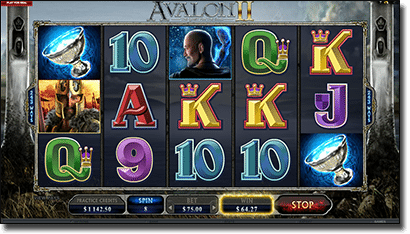 The great thing about playing Avalon II through any of the recommended sites above are the welcome or sign-up bonuses they offer for registering, depositing and playing. All of the casinos recommended on our site have undergone our stringent testing process to ensure game fairness, safety and user-friendliness, so when you play Avalon II at any of the top-rated casino sites in the table above you can rest assured you are playing at a secure and fair online casino that accepts real money players. In descending order of value, the symbols are the Avalon II Wild, Arthur, Merlin, Guinevere, Morgan, the Black Knight, Ace, King, Queen, Jack, 10 and nine. Avalon II has so many bells and whistles that at first I was a little overwhelmed. My god, I thought, with this many features it looks as though this pokie has been designed to give money away. First lets talk about the expanding Lady of the Lake Wild symbol. Only appearing on reel three, if the Lady of the Lake symbol contributes to a win, it expands across the whole of reel three, so the entire reel is wild, and then all wins are paid accordingly. The Avalon II logo is another wild symbol. This wild can appear across all five reels and is a stacked wild, which just stacks your chances of winning. Randomly throughout play, Merlin can make an appearance to gift you with a cash prize or to multiply a win. The feature is triggered by three or more scattered Holy Grail symbols. Once this is achieved you are taken to a different screen that shows a map, presumably of Avalon, with a pre-determined journey laid out for you: this is the feature adventure. Along the road you will notice there are eight stops. Each stop represents a different mission/feature. Each time you complete a feature you return to normal paid plays and the next time you spin three or more Holy Grail scatters you move on to the next feature in the quest. The feature games are as follows: Lake of Legend requires you to re-forge the six shattered pieces of Excalibur. Each piece is allocated a number between one and six and you have ten rolls of a dice. Each roll of the dice gives you a bonus. Misty Vale gives you 15 free spins where you get to choose an extra character to double as a wild during the free games. From here you must choose which path to take. Your choices are Whispering Woods – a choice between five shields presented by the White Knight, Forrest Falls – 20 free spins with trailing wilds, Dusky Moors where you must match two helms to reveal a multiplier and bonus cash prize. Morgan’s Keep is 20 free spins with rolling reels where multiple wins also lead to an increased multiplier up to six times. 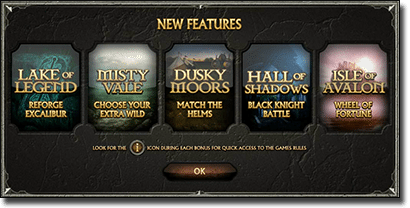 Hall of Shadows sees you engage in an epic battle with the Black Knight for the Holy Grail where each blow you land or block rewards you with a bonus. Finally the Isle of Avalon is a wheel of fortune style feature where you can spin up a reward. Get out there and begin your adventure with Avalon II. This is a strangely addictive game with more chances to than there are stars in the sky. Start playing Avalon II pokies now and experience a multitude of other interactive and immersive online video slots at Royal Vegas Casino..